This rich dish is one of our most popular meal ideas for date nights or special occasions. Serve this mix of white wine, garlic, and fresh clams on a bed of angel hair pasta for a complete meal with little effort. RecipeSavants.com This rich dish is one of our most popular meal ideas for date nights or special occasions. Serve this mix of white wine, garlic, and fresh clams on a bed of angel hair pasta for a complete meal with little effort. 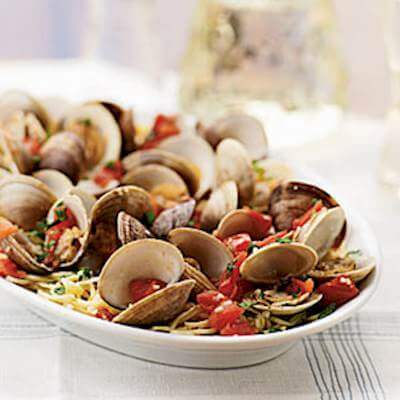 Smart Recipes, American Recipes, Seafood Recipes, Recipes Seafood American Clams With Angel Hair Pasta PT30M Serves 4 Ingredients: 1 Cup Tomato 1 Tablespoon Olive Oil 1 Tablespoon Garlic 0.33 Cup Dry White Wine 0.25 Teaspoon Crushed Red Pepper 1 Tablespoon Butter 4 Teaspoons Fresh Flat-Leaf Parsley In a large skillet, heat oil over medium high heat. Sauté garlic, tomato and pepper for 1 minutes. Stir in juice and wine and bring to a boil. Add clams, cover the pan and cook until clam shells open, for about 7 minutes. Discard open shells and transfer clans to a plate using slotted spoon. Add butter into the pan and stir until melted. Place pasta over serving platter, top with clams, broth and parsley.